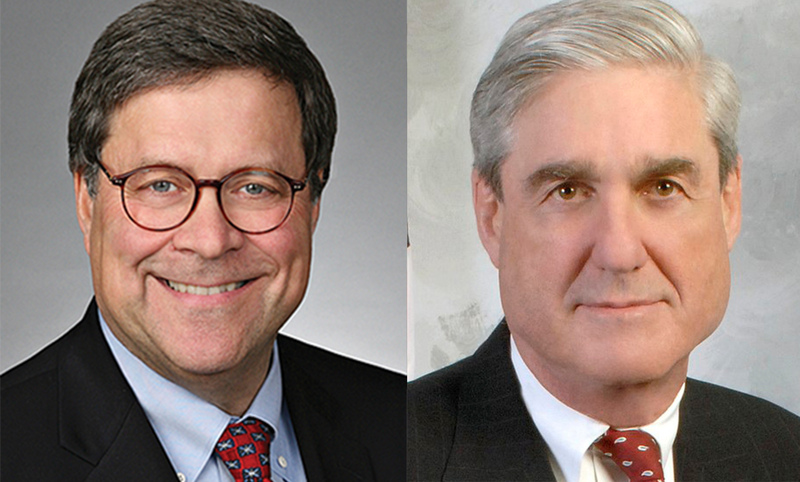 Attorney General William Barr and special counsel Robert Mueller. Democrats said they would continue to investigate President Donald Trump after Attorney General William Barr said special counsel Robert Mueller had not found any collusion with Russia by Trump or his campaign. Barr released his summary of Mueller’s principal conclusions Sunday, the New York Times reports. The first suit seeking release of the confidential report—filed by the Electronic Privacy Information Center—was filed under the Freedom of Information Act on Friday about an hour after Mueller gave his report to Barr, the National Law Journal reports. Top Democrats, meanwhile, called for release of the report, according to the Washington Post and the New York Times. “The American people have a right to know,” said House Speaker Nancy Pelosi of California and Sen. Chuck Schumer of New York in a joint statement. Democratic Rep. Jerrold Nadler of New York, who chairs the House Judiciary Committee, said his committee would move forward with its obstruction investigation, and he would call Barr to testify. He also vowed to seek full access to the report. Nadler focused on part of Barr’s report concerning obstruction of justice by Trump and said Barr had prejudged the matter. Mueller had stated that, “while this report does not conclude that the president committed a crime, it also does not exonerate him,” according to Barr’s summary. In making the determination, he and Rosenstein noted that the evidence didn’t establish that Trump was involved in the underlying crime of Russian election interference. The absence of such evidence “bears upon the president’s intent with respect to obstruction,” Barr said. Barr had written last June that obstruction laws don’t “criminalize just any act that can influence a ‘proceeding.’ ” Rather, they generally target actions that compromise the integrity of judges and juries or impair the integrity or availability of evidence, he wrote. Barr also had written in June that Mueller was apparently investigating Trump for telling FBI Director James Comey that he hoped he could let go of the investigation of Michael Flynn and for later firing Comey. But the president has the authority under the Constitution to remove an official, to use his prosecutorial discretion to give direction on a case, or to use his pardon power, Barr wrote. Katyal says Barr can’t make conclusions about whether Trump acted with corrupt intent without anyone interviewing Trump.